As you bite into a fresh apple, are you getting more than you bargained for? Do apples and other fruits and vegetables actually have pesticide residue? 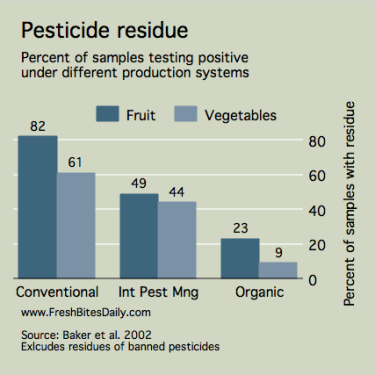 In 2002, researchers examined pesticide residue on common fruits and vegetables comparing conventionally-produced crops to those produced using an integrated pest management system and those that were certified organic (see study). All classes of produce had some pesticide residue, but organically produced produce was likely to have much less. Budget-conscious consumers can arm themselves with tools such as the “Dirty Dozen” list of produce most likely to have pesticide residue and the “Clean Fifteen” that are least likely (see the list here). Put your organic dollars into the dirty dozen which include such fruits as strawberries and peaches, fuzzy on the outside and apparently also pesticide magnets. Be less concerned about onions, eggplant, and cabbage. Organic Versus Conventional Produce: Is There a Difference? 2 Comments on "Pesticide in Produce: Does Organic Matter?" Most of them not only have pesticide residues, but they are also sprayed with pesticides. And to remove those you’d have to wash the apple for who knows how many minutes, because it sticks to the outer skin to the point you’ll have to peel it off.